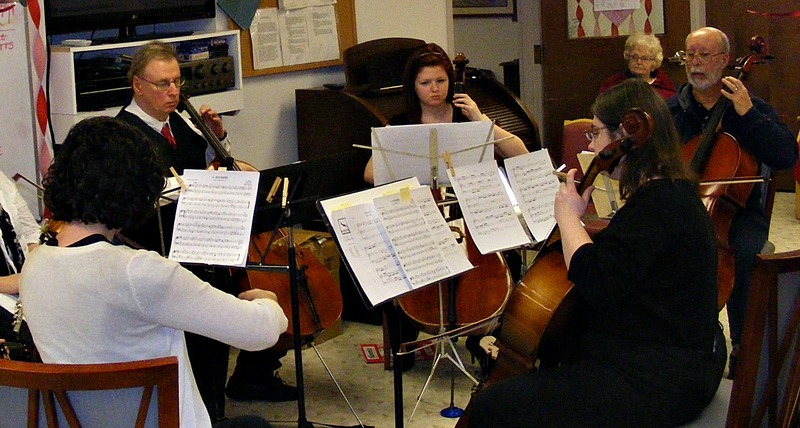 CelloBrationS was welcomed back to Cambridge Village on February 7th for an evening of chamber music. The group played trios by Chopin and Beethoven. The program included Vanhal’s Notturno, a quartet for flute, viola, and cello. The audience was also treated to duets for viola and cello by Telemann and Bach. The evening included a premier of Bach’s Sinfonia 3, BWV 789 arranged for trio by the music director. “Let Me Call You Sweetheart” a quartet arrangement featuring the violist ended the concert. This entry was posted in cello photos, cellobrations, Photo Album, string quartet, string trio and tagged Bach, Beethoven, cello, cello music, cellobrations, chamber music, Chopin, duet, flute music, quartet, Telemann, trio, Vanhal, viola, viola music, violin. Bookmark the permalink.